Going over the edge takes guts, a fistful of courage to guide one’s purpose forward in order to take another step which might be fortune. Within any kind of music, exploration is the key, especially if there is a wish to come up with freshness while not be bounded in what is seems to be easy to accomplish. Gathering their forces out of various of local extreme Metal acts in Sweden, ex-members that didn’t wish to remain behind, ZORNHEYM was founded. 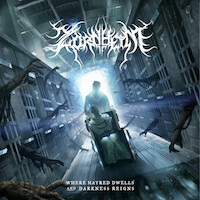 Pictorials of horror never seemed more vivid through music up until the band’s coming debut release “Where Hatred Dwells And Darkness Reigns”, newly signed to Non Serviam Records. Even without being a horror theme fan, an intriguing musical experience is well placed and in order. To write about ZORNHEYM’s chaotic prospect is closely similar to trying to put order in turmoil, but I will try my best not to lead you through many paths. The cinematic endeavor of “Where Hatred Dwells And Darkness Reigns” is one of those enigmatic albums that its storytelling takes the listener through various of foggy routes, which may never be clear at the end. Nonetheless, the expectation, excitement and adrenaline will keep one tuned in with an appetite for another mystified tale. In their basis, ZORNHEYM created a graceful, yet deadly, borderline within extreme Metal, established by a magnificent sound production. Their technical expertise and melodic direction, hashed wonderfully diverse creations that should have a good chance to set the tone forward for the genre. When nothing is foreseen, or formulaic, the surprise effect is imminent and always welcome. Other than their journey through the modern and technical based form of Black and Death Metal, ZORNHEYM successfully employed a real string orchestration and a choir of voices named “Chorus Tenebris”. In general, it appeared to me like an upgraded version of DIMMU BORGIR / SATYRICON and DEVILISH IMPRESSIONS with the vigor of DISSECTION and themes out of the twisted mind of KING DIAMOND. Furthermore, the album’s tracklist arrangement was made to perfection, enabling a haunting instrumental intro nearly right before each of the stories presented, mostly as singular tracks and at times as an indispensable part of the larger picture. I found “Whom the Night Brings…” and “A Silent God” to be the album’s higher forms of enchantments, fierce songs that would let you thoroughly enter ZORNHEYM’s twisted realm, breathing in their harshness and harmonic dexterity, added by voices and vocals that will rattle your foundation. I have noticed that there is a swift rise towards the old school platter of each of Death and Black Metal genres. Honestly, it is a direction was never abandoned, but from time to time it appeared to be minimized with the rise of the modern spirit flowing through the music. Therefore, there aren’t too many bands that invest so much into making their extremity cross out of the box and into uncharted universes. I believe that the cinematics within this blending is yet to be fully noticed, and with bands like ZORNHEYM, things should take a different course.